ADCIS and the LERMAT, a research laboratory specialized in Material Science jointly developed automatic tools to analyze ceramics using Image Processing techniques. During the course of this 2 year project, two types of ceramics were analyzed, a ceric oxide, used for sintered analysis, and alumine-zircone, a two phase material used for grain detection and analysis. A scanning electron microscope was used to acquire black and white, very high resolution images. Some filtering operators were applied to the images to enhance their quality by removing visible noise. 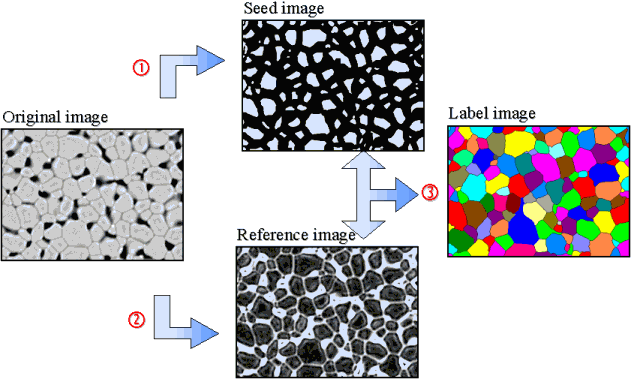 Segmentation of the images involved automatic thresholding techniques to detect grains and pores, and various morphological operators such as top-hat, skeleton by zone of influence, watershed with constrained markers, and other functions looking at the size distribution of particles. 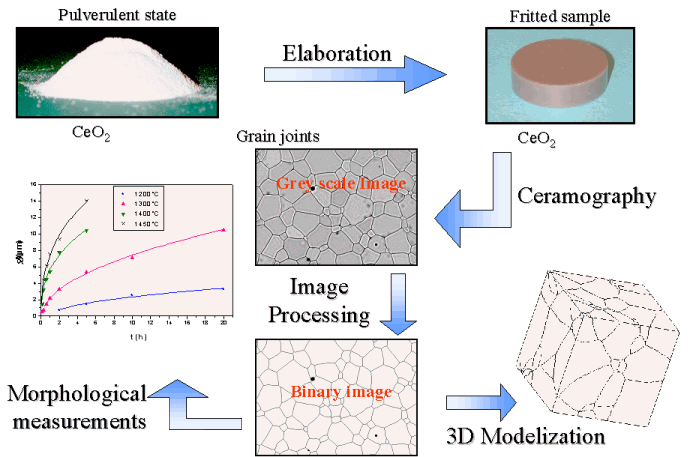 The images below present an example of image processing algorithms applied to a ceric oxide sintered at a temperature of 1200 degrees during a 5 hour process. 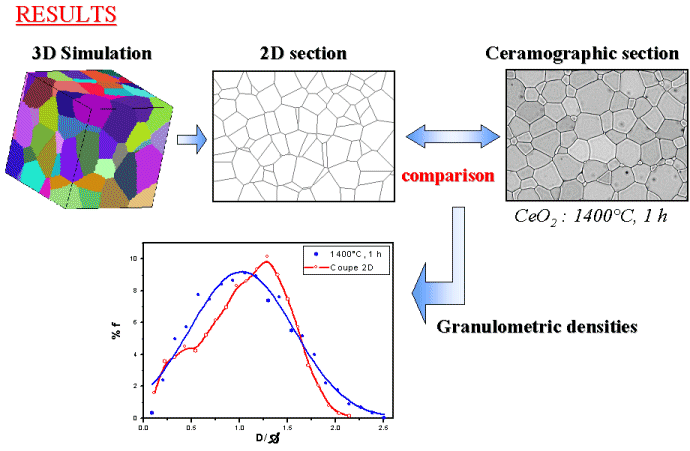 The research work also involved an in-depth analysis of the sample to measure characteristics such as granulometry, evolution of the volumic fraction versus the temperature, kinetics laws, pore dispersion, etc. 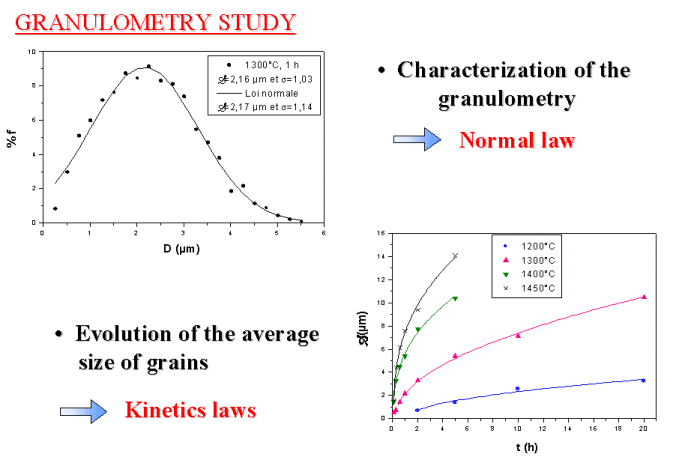 The following chart displays the evolution of the granulometry. Finally, some probabilistic models were studied to determine a model for the micro-structure. This comprehensive work was performed within the scope of a Ph.D. thesis, and was partially funded by an ITIC grant from the Normandy region in France. All image processing and analysis functions were developed using Aphelion™ and are now available as a set of macros written in Basic Script.